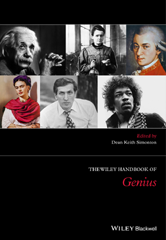 The Handbook of Genius is the first reference work to discuss all aspects of genius, a topic that endlessly provokes and fascinates. Bringing together essays from a multidisciplinary group of contributors, this book covers the origins, characteristics, careers, and consequences of genius. What Tools from Neuroscience Can Be Used to Study Creativity? How Should a Neuroscientist Identify Subjects for Study? What Kinds of Tasks Can Be Used to Assess Creativity Using Neuroimaging Tools? What Have We Learned from Our Work So Far? A Final Question: What Then Is the Basis for Genius? Are Geniuses Black Swans, Dragon-Kings, or Hopeful Monsters? What Does Giftedness in Visual Art and Music Look Like? Intelligence and School Performance: An Early Life Advantage? 29 Does Genius Science Have a Future History? Will Empirical and Theoretical Research Continue to Advance? Will the Phenomenon of Genius Continue to Exist? Will the Science of Genius Ensure the Continued Existence of Genius?